In this edition of Today’s Lifeline, we have the privilege of sharing the simple but blazing story of a man with humble beginning, who climbed every rung of the ladder in journalism holding his core values, till his excellent achievements were undeniably evident to all. He is currently the Special Adviser to the President on Media and Publicity. He was former Managing Director and Editor-in-Chief of The Sun newspapers and also former President of the Nigerian Guild of Editors. He has won several accolades and awards in the field of journalism. 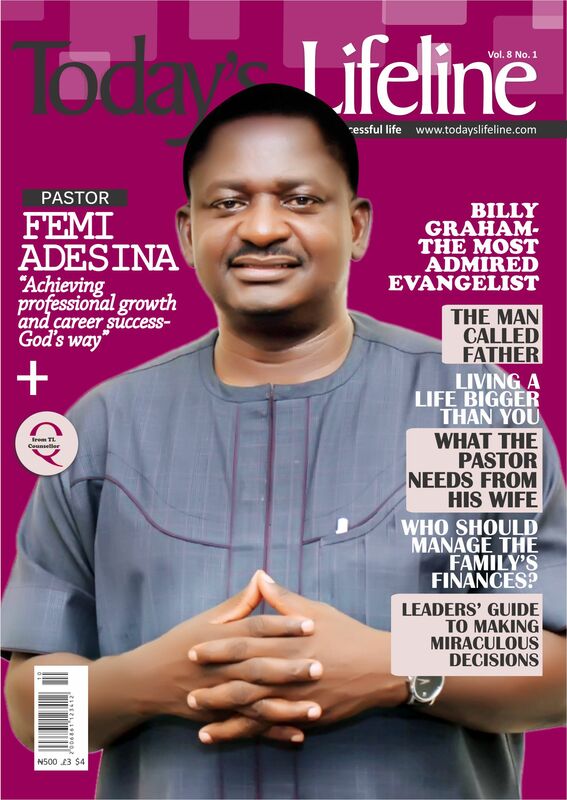 Femi Adesina who is also a pastor with the Foursquare Gospel Church in Nigeria shares the remarkable story of his excellent journey to significant influence. The man of God we interviewed for this edition of Today’s Lifeline Magazine is unique in many ways; not only can he quote from about seventy-five percent of the New Testament by heart, he has demonstrated by his lifestyle similar sacrifices described in Apostle Paul’s epistles. 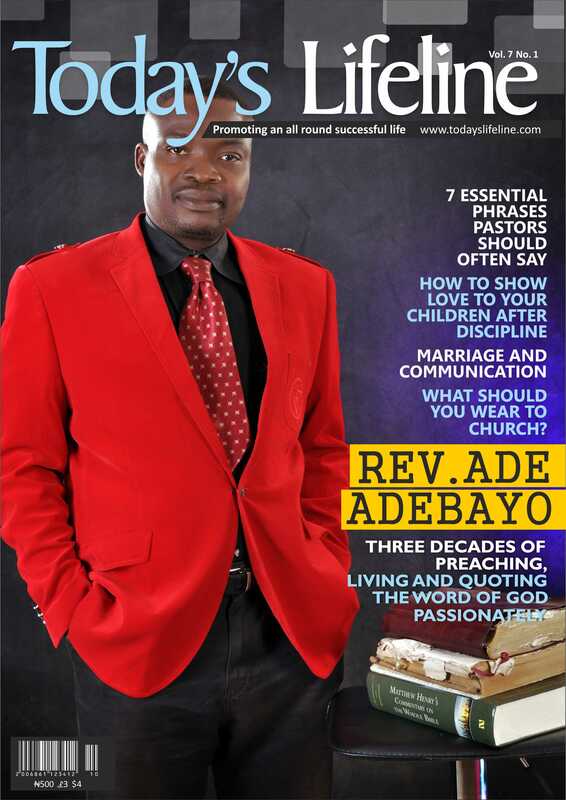 Reverend Ade Adebayo or “Revo” (pronounced Rev-oh), as he is fondly called by many is a man who has chosen to preach the full gospel of Christ. He has relentlessly committed himself to the course of Christ striving to make Him known through the Church he leads, in his home, and his attitude of dogged determination to make decisions that honor God. Revo shares many nuggets of what he considers a singular truth with us in this precious interview. As you read, the theme for Revo’s life and ministry begins to evolve. Vol 6 No. 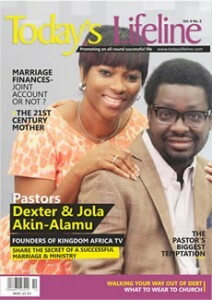 2 This new edition of Today’s Lifeline features the founders of Kingdom Africa TV, Pastors Dexter & Jola Akin-Alamu. They share the secret of their successful marriage and ministry. Our regular columns are also presented with new content to nourish your souls with heavenly insight, comfort and assurance. The purpose of Today’s Lifeline remains to help you live an all-round successful life and the articles we present in this edition will further lead you towards that goal. Place your order today. Vol 6 No. 1 In this new edition of your beloved magazine, Dr. Victoria Michaels shares how God drew her into a relationship with Himself, and her motivation for the Kingdom assignment. We also have the inspiring story of Watchman Nee, a Chinese student who later became a great evangelist and preacher. There’s a new column on Leadership Effectiveness to helpdevelop the leader in you. Our regular columns are also presented with new content to nourish your souls with heavenly insight, comfort and assurance. Vol 5 No. 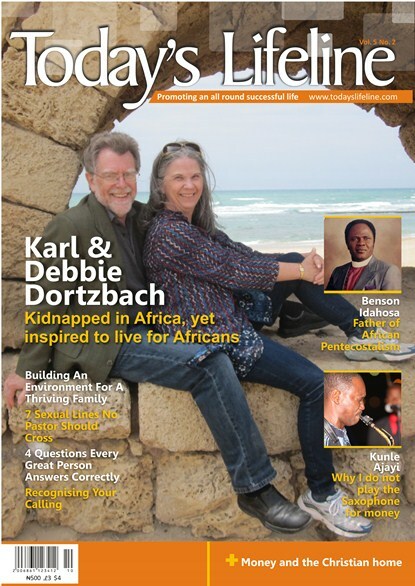 2 In this Volume 5 No 2 edition of the magazine, we present Karl and Debbie Dortzbach, as well as Kunle Ajayi- people who have demonstrated their love for God by their lifestyle alongside our regular contributors. We also have a new column for Church Leaders. The purpose of Today’s Lifeline is to help you live an all round successful life and the articles in this edition are all meant to point you towards that goal. We encourage you to take time to meditate on every article you read. We assure you that the results will soon be evident in your life. Vol 5 No. 1 This edition is a real wow! 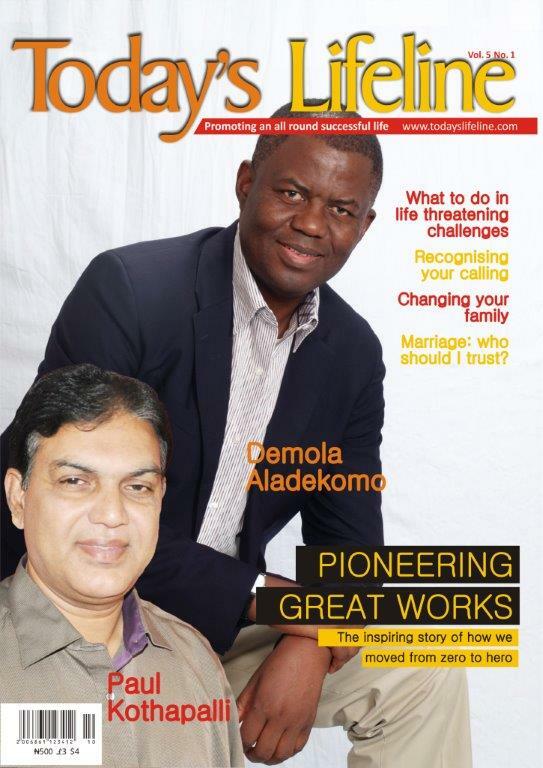 We were privileged to interview two great men and their insights can catapult you to greater heights in record time. Interestingly, they were both born in 1957 and share real life experiences of how God took them from the miry clay and set their feet on the ground of significance. We were personally challenged just by listening to them and we believe God has a message for you as you read their words. Vol 4 No. 3 In this edition, there’s something in it for everyone. It contains soul-lifting and interesting articles combined in another package of Today’s Lifeline magazine. Read the life-transforming story of a man who had first class in Physics from the University of Ibadan at twenty, had his Masters degree in Communication Engineering from Imperial College London and had projected that he should be a multi-millionaire by the age of thirty. But, like Apostle Paul, God altered his focus in life to a better and more fulfilling direction and today, he is the Senior Pastor of Scripture Pasture Christian Centre, Ibadan. The magazine also contains the usual spiritual diet designed to nurture and enrich you in the journey of life. Strengthen your faith with the story of a woman who had her first babies, a set of twins, after 26 years of marriage. Vol 4 No. 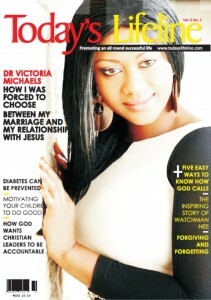 2 Today’s Lifeline Magazine is out with insightful articles and interviews. There’s something in it for everyone. 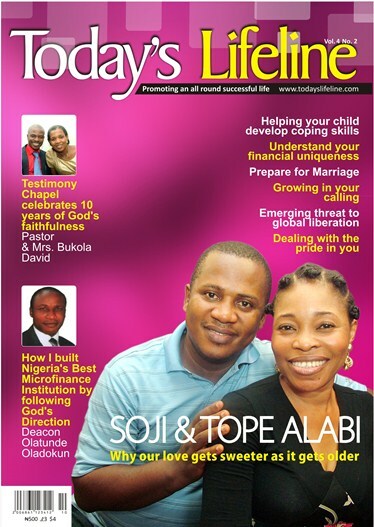 If you want to know how you can enjoy marital love that gets sweeter as it gets older, then you need to read the major interview which features Soji and Tope Alabi (renowned gospel music ministers). We also had an interview with Deacon Oladokun – the Director of Nigeria’s best Microfinance Institution (SEAP); he shared his motivation and success secrets. The articles in this edition also answers questions like – How do you prepare for marriage? How do you grow in your calling? How do you deal with the pride in you? How do you understand your financial uniqueness? How do you help your child develop coping skills? Vol 4 No. 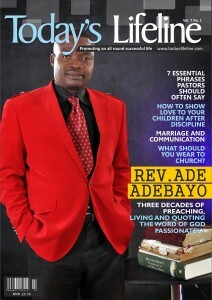 1 This edition features a 10 page interview with the man popularly known as a Walking Bible – Rev. 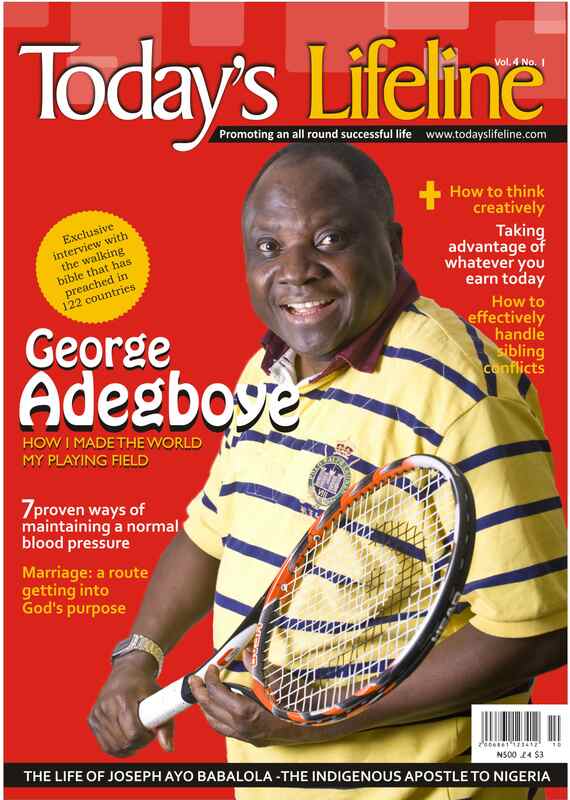 George Adegboye. It is believed that more than 300 prominent ministers in various churches and denominations in the world today (e.g. Rev. Sam Adeyemi, Rev. Ade Adebayo, Pastor Olubiyo) had served with him previously at Rhema Chapel International, the church he founded in 1981. Having preached the gospel of Jesus Christ in 122 countries in a world of about 196 countries, he has made real what he said several years ago that “the world is my constituency”. Rev. George shared some very powerful and timely messages that is a must read for every Christian in this generation. 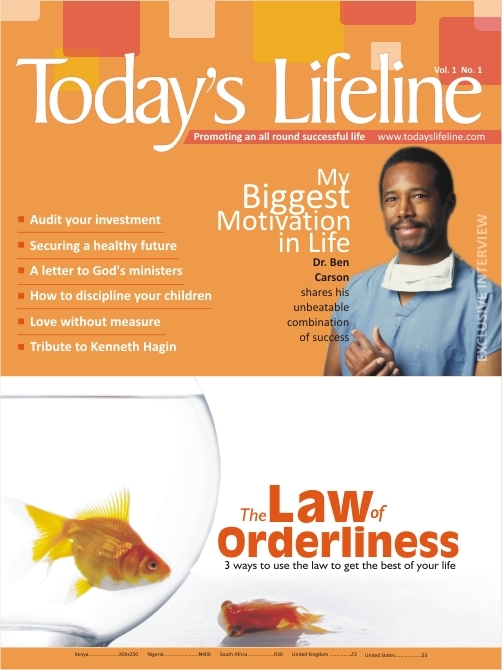 Also, some of the awesome articles in this edition of Today’s Lifeline include How to think creatively; Taking advantage of whatever you earn today; How to effectively handle sibling conflicts; 7 proven ways of maintaining a normal blood pressure; and how you can use your marriage to get into God’s purpose. Go right ahead to get your copy so you could savour these flavours from the Saviour. Vol 3. No. 3 In this edition, you will read pieces that will motivate you to identify and seize opportunities. You will be driven to serve God’s purpose wherever you are, stand out in your world and attract people to Christ as a result. There are more tips for Small Business Managers, secrets for building a culture of innovation, guidance for spending quality time with our children and bringing them up in the way of God. And there’s a very important piece that focuses on health and much more. 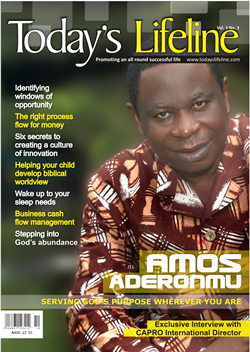 You will love the exclusive interview with Amos Aderonmu, CAPRO’s International Director. In addition, after reading this piece, you will have a better view of the word and the world. Vol 3. No. 2 This edition is mind-blowing; it will bless your life and press you into the boundaries of God’s plan for your life … In this issue, we bring you yet another series of brilliant write-ups to support this process of holy and productive living for every reader. We have articles to inspire you to venture out to achieve your dreams, identify opportunity, enjoy your life whether single or married, fight anxiety as well as crucial health counsel. You will also learn how to defeat the devil when he attacks your marriage, how to teach your kids to read and help them succeed in life, to execute strategic business ideas and more. 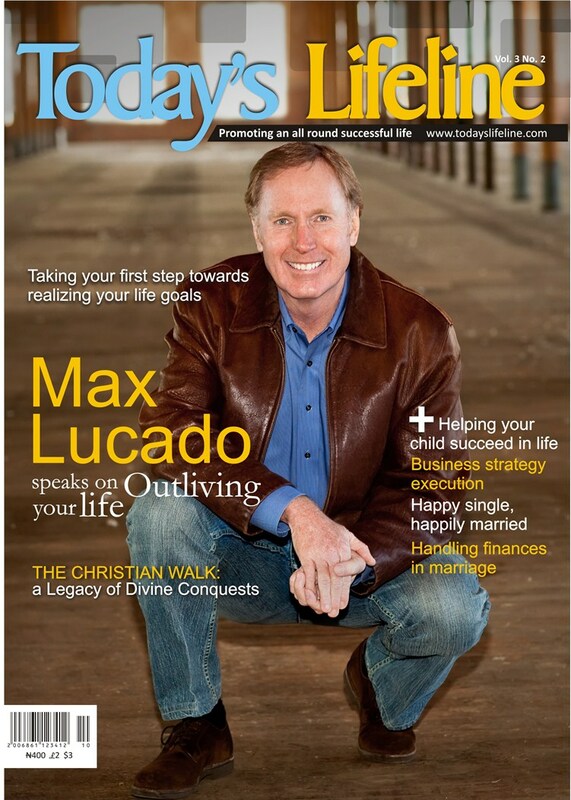 This issue also features an interview with Max Lucado on outliving your life. You WILL enjoy this package! Vol. 3 No. 1 It may not be news to you that some employers don’t want to employ ‘Christians’ anymore. Some reasons have been adduced for this practice and this edition has a great deal of information on this. You should read this if you plan to get and keep that dream job. 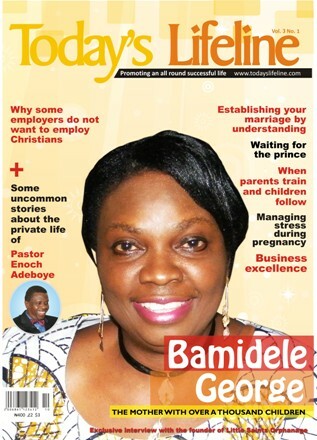 This edition features an exclusive interview with the founder of Little Saints Orphanage (Mrs. Bamidele George), the first registered private orphanage home in Lagos State, Nigeria. It also contains a review of some uncommon stories about the life of the General Overseer of RCCG – Pastor Enoch Adeboye. In addition, we share explicit insight on business and finance management, marriage; parenting, excellent work ethics; pregnancy, leading illuminating Christian lifestyles, and much more. Grab your copy, assimilate every ‘morsel’, practice them, and incorporate into your daily living for maximum impact. Vol. 2 No. 5 Purposeful living is becoming a tag line for many activities and sermons in our days because every thoughtful human seeks a deeper meaning to existence beyond just making a living. And in our feature article we bring you a concise checklist of five things that can help you determine if you are indeed living your life on purpose. 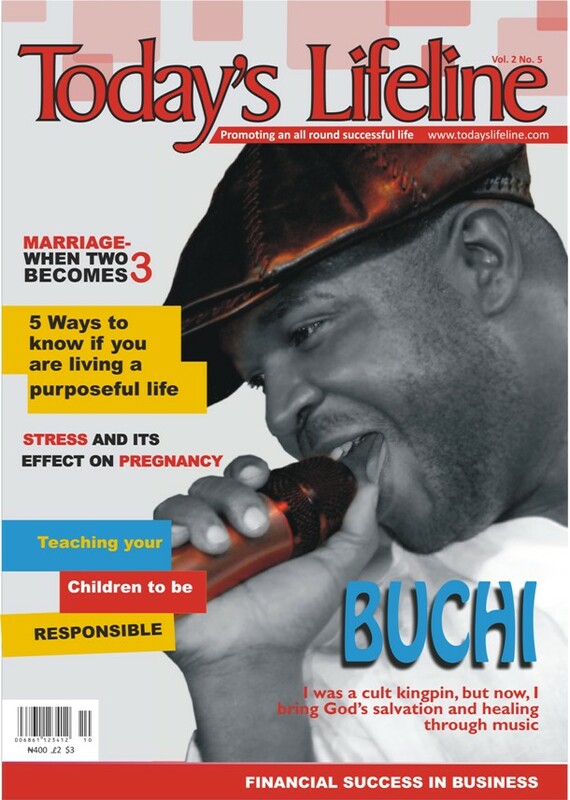 Our tęte-ŕ-tęte with Buchi, a famous Nigerian gospel musician further illustrates the place of purpose in the life of a believer and how God orchestrates events to achieve His divine purpose in lives that are yielded to Him. In our customary manner of promoting excellence in every sphere of life, we have all our usual columns packed with uncommon substance that is sure to bless your life. Vol. 2 No. 4 From our lead article on “Love-How you can Make it Last?”, to “Love Does not Demand its Own Way” in Family Affairs column and “Fidelity” is discussed in the Love Line column. These are just a few of the goodies in this blessed package. 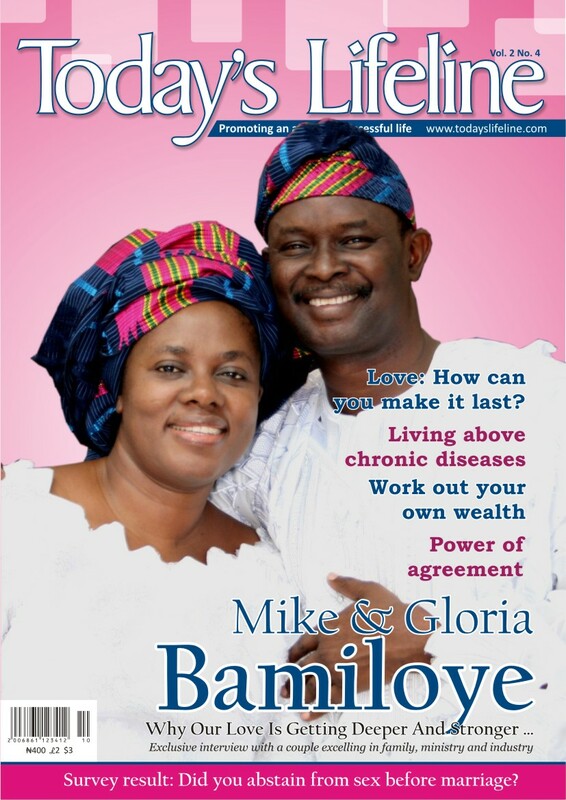 We also interviewed a wonderful couple familiar to many of our Nigerian readers to decode the secret of their successful marriage and ministry—hear from Mike and Gloria Bamiloye, the gurus of gospel drama production. Vol.2 No. 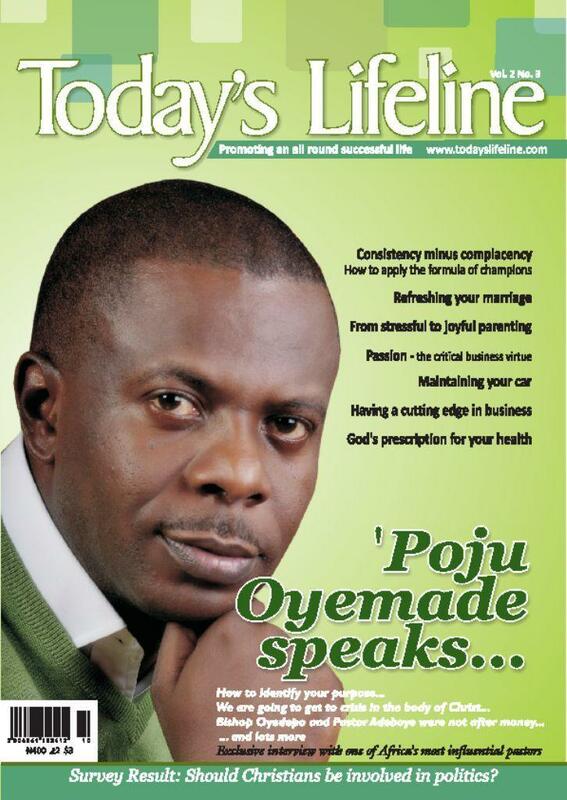 3 Meet one Africa’s most influential pastors – Pastor ‘Poju Oyemade. He is the Senior Pastor of one of the fastest growing churches in Nigeria – Covenant Christian Centre and the host of three regular television programmes aired on several stations Nationwide which include Insights for Living, The Quantum Leap (TQL) and a Single’s programme called Singled Out. In this exclusive interview with Pastor ‘Poju, he discussed the following: • How to identify your purpose… • We are going to get to crisis in the body of Christ… • Bishop Oyedepo and Pastor Adeboye were not after money… • The greatest challenges you will face in ministry … • … and lots more. Other inspiring articles in this edition include: • Consistency minus Complacency – How to apply the formula of champions • Refreshing your marriage • From stressful to joyful parenting • Passion – the critical business virtue • Maintaining your car • Having a cutting edge in business • God’s prescription for your health • Taking the necessary risk, etc. Vol 1. No. 2 This edition is revealing, thought provoking, inspiring, and instructive. Our lead article described how to get a helicopter view of your life. We were particularly instructed on how to regularly stand back from the field of play in order to stand out, as well as the 5 key areas of our lives we need to evaluate while having the helicopter view. 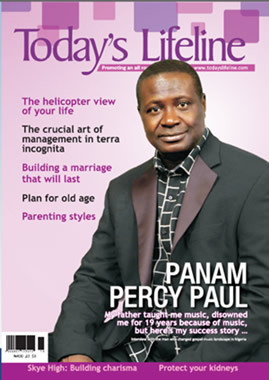 We also featured an exclusive interview with the man that changed gospel music landscape in Nigeria – Dr. Panam Percy Paul. This interview with Dr. Panam will encourage you to live your full potential for God without allowing anything stand in your way. In keeping with our tradition of promoting all-round successful lives, we also shared other inspiring articles that address all the vital areas of life. Some of them includes: Building a marriage that will last; parenting styles; plan for old age; the crucial art of management in terra incognita. Vol.1 No. 1 January 2009 This maiden edition is a gift to humanity and it attempts to teach us how we have been wired by God to function optimally in this world. We also had an exclusive interview with Dr. Ben Carson and he shared: • His success secrets. • His biggest motivation in life. • His view and his personal experience on God’s purpose for an individual. He also gave his advice: • To upcoming generation • To parents in Africa about the important things they could do for their children to make them succeed in life. Other articles in this edition include – The Law of Orderliness; Love without measure; Audit your investment; How to discipline your children; Securing a healthy future; The Christian marriage in god’s program, etc.